Order by Phone - Call Us for a Shipping Quote! Create a major league look at your facility! PolyTube Cap is the ideal affordable fence guard - a very economical protective chain link fence cap. It is an extruded corrugated pipe that fits over standard chain link fencing. 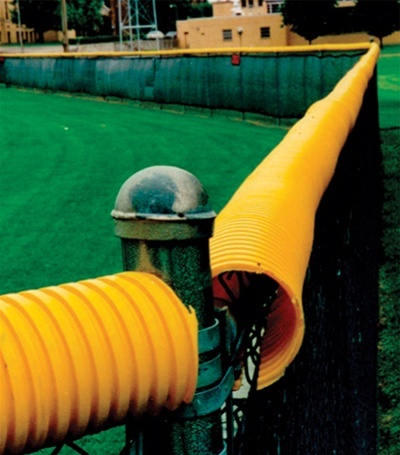 Available in bright yellow or dark green, PolyTube Cap is an inexpensive way to add safety, visibility, reduce player injuries and beautify any park, facility or outfield. Weather treated and UV-protected so it won't fade, this 4-1/2" diameter polyethylene corrugated pipe will provide long-lasting protection. PolyTube Cap is available in two roll sizes of 100 ft (35 lbs) or 250 ft (85 lbs). Each 250ft or 100ft section of PolyTube is attached to standard chain link fencing using your own or our color matched zip ties. Install PolyTube Cap by simply opening up the aperture and clamping it over the top rail of the fence. Secure PolyTube Cap to your chain link fence at 3-foot intervals using ordinary zip ties. Speed installation of the PolyTube Cap up to 75% faster with the optional Installation Tool. The tool keeps the aperture of the cap open while you fit the corrugated pipe over the top rail.